Do you ever feel bored or burned out? Boredom can be relative based on the topic being written on, so I guess that can be the same even for a blog writing service provider. But a good SEO blog writing service never gets burned out and enjoys creating great content for your blog. Why is he explaining the attributes of a SEO blog writing service? Well because I want to tell you about The Hoth. The Hoth is a white label search engine optimized (SEO) Agency. They work with marketing agencies to provide quality content for their marketing campaigns, and thanks to the blogger services they offer, they get the job done perfectly every time. At The Hoth, they not only write the articles for the clients, they also create topics when the clients find it difficult to come up with one. In such a situation, they simply request the clients give an idea of what they want to talk about and they handle the rest from there. 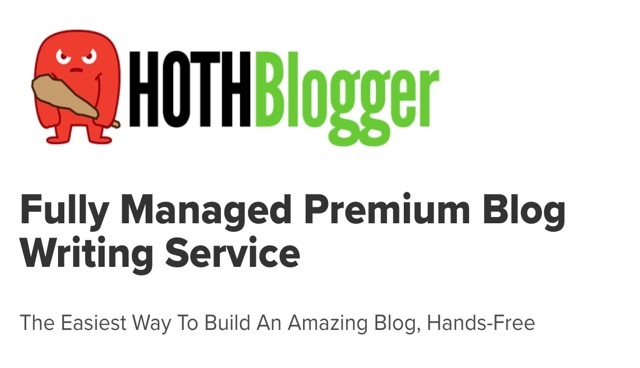 The Hoth Blog Writing Service can be found under the blogger product. The blogger product is a manage blog service the Hoth offer to clients. The Hoth not only helps the clients write the articles, but they also create topics, engage in topic research for their clients, write the blogs, edits the blogs if the need arises, also post the blogs on the clients WordPress site. What makes an article reach the target audience is knowing the right keywords to use when writing the articles. This is where the search engine optimization (SEO) comes in and working with The Hoth will give you just that. In addition to that, the office environment appears to be pretty enjoyable as seen in the video above. So how could their articles be boring? The Hoth blog writers are encouraged to enjoy writing for your blog. This way when the writer is having fun writing, the fun is embedded in the blog for the reader to also enjoy. The research carried out by the Hoth before the writing and during the writing process can be said to be what sets them apart from the other blog writing service providers. This is because the Hoth does not outsource their work, unlike other blog service providers. Although I’m not concluding that other blog writing services outsource their jobs, I can only conclude that they do not put in as much effort as the Hoth does when getting the job done. At The Hoth, the writers are vetted really highly. This means the writers go through a rigorous hiring process, and even after selecting the best writers, they still go through a thorough training process. The clients are not forgotten even after the job. The Hoth pushes to keep in touch with past clients to check in on how much they like the services. And check to see if there are any areas that need improvement. We hope you enjoyed this SEO blog writing service review of The Hoth. As we mentioned earlier, there are a number of great blog writing service providers to choose from, but none quite as good as the Hoth.